Amateurs often attribute the unethical intentions of individuals to the language those individuals use. Jargon is a case in point. Is jargon bad or evil or wrong? If you read my posts on passive voice and persuasion, you know I see considerable confusion between the tool itself and the intent of the person using it. So I see nothing inherently wrong with jargon. 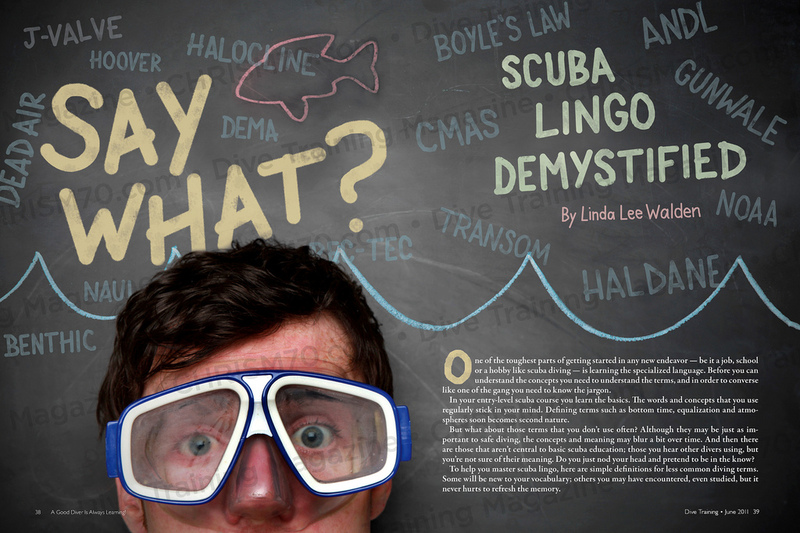 Although I’m not an expert on scuba or its jargon, I predict the words shown on the book cover here were created for benign — even positive — reasons. Jargon words are created as shorthand. Consider the word, scuba, which originated in the 1950s as an acronym for self-contained underwater breathing apparatus. The first people using the word must have found it efficient to use the two-syllable acronym instead of the thirteen-syllable noun phrase. Their use of the acronym around others would have been confusing initially. When they needed to communicate with non-experts, they had to use the phrase. Eventually, those non-experts adopted the acronym, and it has become an English word in its own right. Until it no longer serves a purpose. Thanks for reading. And for your praise. While I do post video-tutorials in some posts (and show the entire collection at proswrite.com/videos), I recognize my relative lack of visual IQ. I welcome specific suggestions. What type of visuals would you have liked to see in this post?